We are excited to celebrate 60 Years in business with you! In celebration of this we are going to have a YEAR LONG contest! All prizes will be drawn on December 14th, 2019. You have all year and multiple chances to enter. We will be closed April 21st for Easter Sunday. 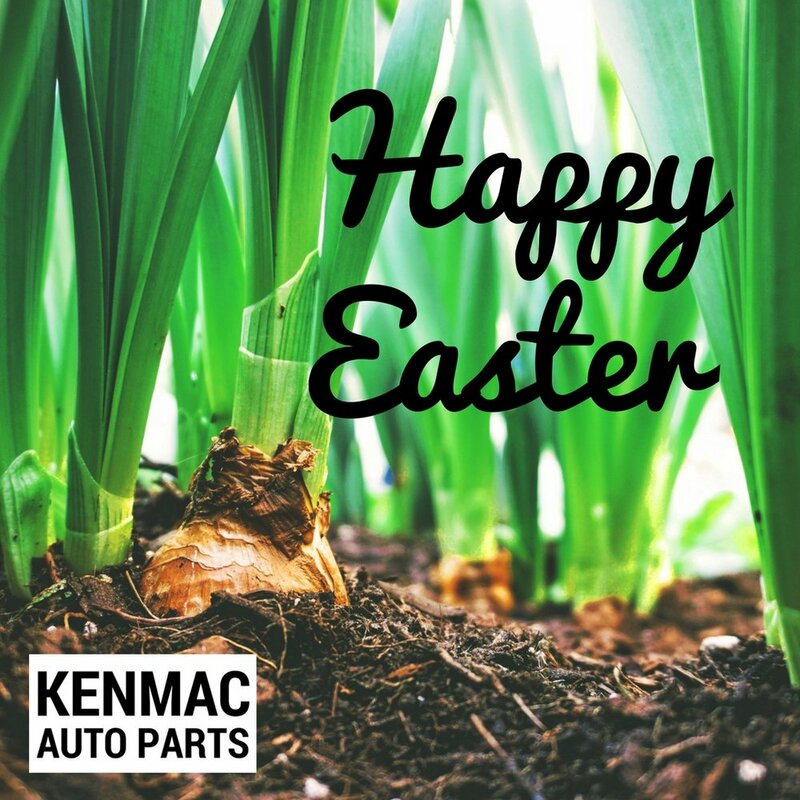 Have a happy and safe Easter. We will be open regular hours on Monday April 22nd. We will be closed for Family Day this Monday February 18th. We will re-open for our normal hours on Tuesday. Have a happy and safe Family Day! Come and learn more about Omeals, watch how it is done, and give it a taste. We are sure you will love these lightweight, portable, self heating meals. They are perfect for hiking, camping, and emergency kits for your car and home. Happy New Year from us to you! We hope you all have a happy and safe New Year. We will be open for our regular hours on January 2nd. 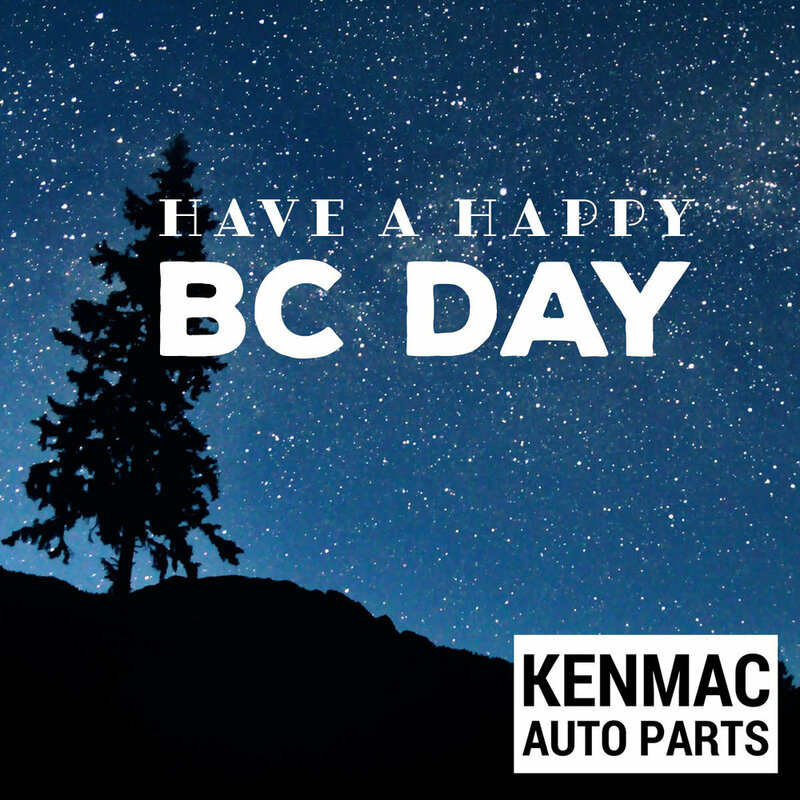 Merry Christmas and Happy Holidays from our family here at Kenmac! We wish you all a happy and safe holiday. Our Night of Shopping for a Cause Fundraiser is THIS WEEK! Not sure what you would possibly need from an auto parts store? We have many things in stock that you might find surprising. 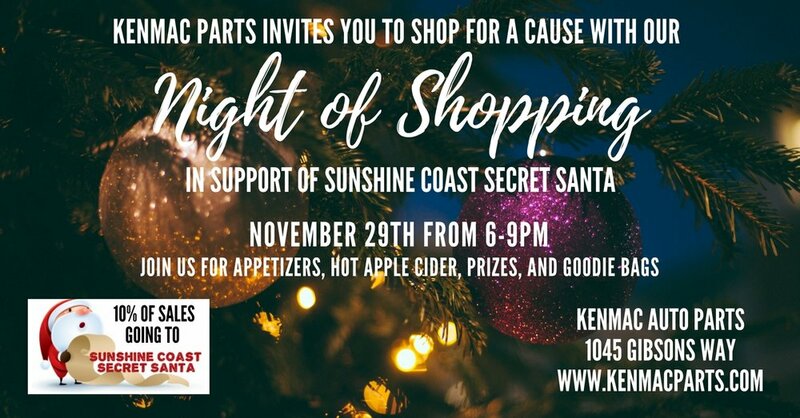 Join us on Tuesday November 20th from 6-9pm at Kenmac Auto Parts at 1045 Gibsons Way for this great fundraiser for Sunshine Coast Secret Santa - For Families in Need. 15% of all sales will be donated to this amazing charity that helps so many local families this holiday season by providing personalized Christmas hampers! We will be closed on Sunday November 11th to observe Remembrance Day. We take time to remember those that fought for our freedom and lost their lives in the process and to thank those that lived for their service. We will reopen on Monday November 12th for our regular hours. We will be closed for Thanksgiving Monday October 8th. We will re-open our regular hours on Tuesday October 9th. We wish you all a happy and safe holiday! We will be closed on Monday September 3rd for Labour Day, and will re-open for our normal hours on Tuesday. Have a happy and safe long weekend! There will be T-Shirt and 50/50 sales throughout the day! Join us after for dinner at the Sunshine Coast Golf Club in Roberts Creek! 8:00 PM: Elvis is back to entertain you! 9:00 AM: Set up and all events start. Line up for the Rod Run will start in the morning. Following the Rod Run, the Blue Ocean Golf Course welcomes family and friends with burgers and beer at their dining room. Elvis is back to perform a set of music! Watch for us in the 50th annual Sea Cavalcade Parade this year! This is always a great time and we look forward to giving you all some goodies! Come for some great deals on old stock! There will be deals, sales, and refreshments. We will be closed Sunday July 1st for Canada Day. We wish you all a happy and safe holiday! We will be open 9-5 on Friday March 30th, 8-5:30 Saturday March 31st, CLOSED Sunday April 1st, and open 8-5:30 Monday April 2nd. 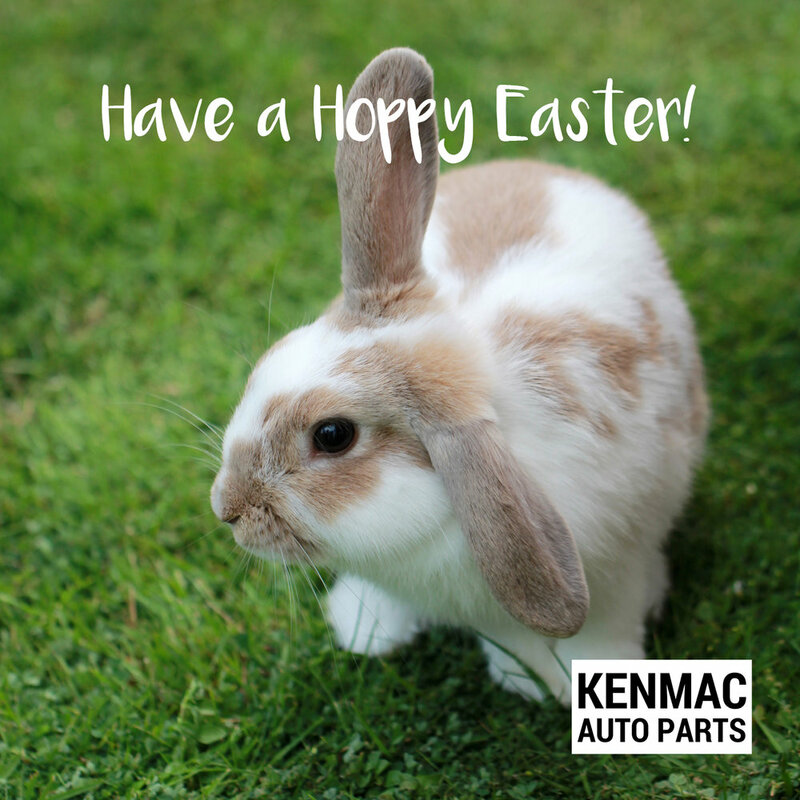 Have a happy and safe Easter holiday! We will be closed on Monday February 12th for Family Day. We will re-open Tuesday February 13th for our normal hours. Wishing you all a safe and happy holiday! Join us for the Annual Breakfast With Santa! Come for a yummy breakfast and a photo with Santa Claus. This is always a great morning put on by the Sunshine Coast Labour Council and The Kinsmen Club of the Sunshine Coast, and is sponsored by IGA. Sunday December 10th from 9AM-12PM at the Kinsmen Hall at Dougall Park, 516 Gower Point Road, Gibsons. Join us for the Annual Festival of Lights in Gibsons for the tree lighting at 6pm Sunday December 3rd at Tim Horton's/Wendy's. This Is an annual fundraiser for different local charities. We hope to see you there! We will be closed for Canada Day Saturday July 1st. We will re-open Sunday July 2nd at regular hours. 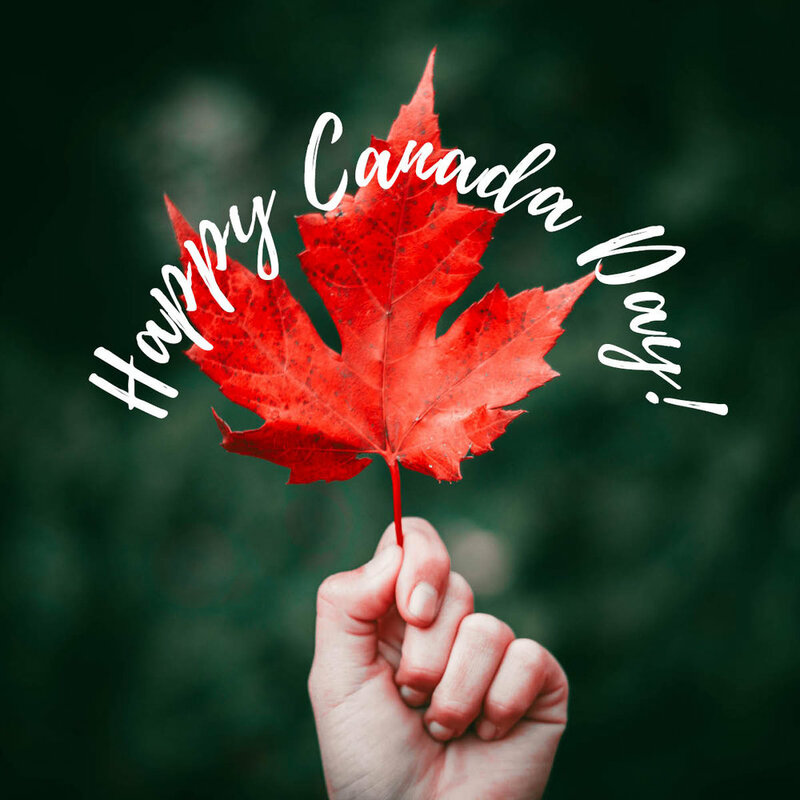 Have a safe and happy Canada Day! Join us for the annual Father's Day Car Show. This will be in Dougall Park starting at 10 am Sunday June 18. Sponsored by the Kinsmen Club of the Sunshine Coast. Join us at the Sechelt Airport for the Spring Forward Drag Race. This event is an all day event. We will be closed for Victoria Day Monday May 22nd. We will re-open Tuesday at regular hours. Have safe and happy Victoria Day!